“The Sri Lankan labor situation differs from that in the Unites States with almost all of the unions affiliated with a political party, and different unions working at the same work site” the US Ambassador to Colombo wrote to Washington. A leaked unclassified US diplomatic cable records the trade union actions against the government. The Colombo Telegraph found the cable from WikiLeaks database. The cable written on November 16, 2009 by the US Ambassador to Colombo Patricia A. Butenis. 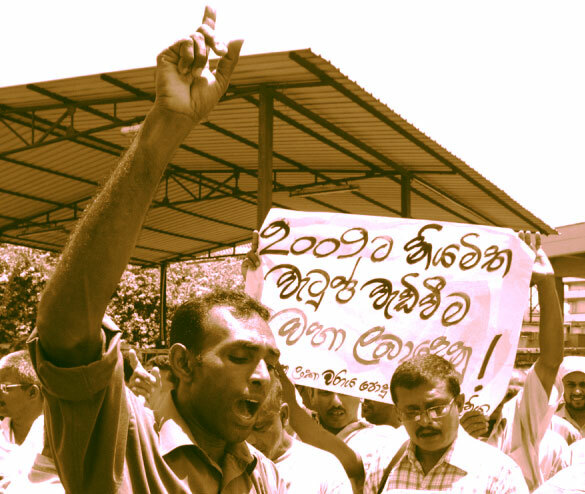 The government of Sri Lanka had not granted any wage increases to these workers in 2009, and had refused to meet with the UNP and JVP unions until the threatened labor action. The government usually provided wage increases in a year collective bargaining agreement (CBA), although the government union claimed that the collective bargaining agreements are just informal deals. In any case, the last CBA expired in January 2009, and the GSL refused to provide salary increases, initially due to the war against the LTTE, and now because of the IMF agreement.” Placing a comment the Ambassador wrote “the IMF letter of intent does not address salary increases, and for the Ceylon Petroleum Company and Ceylon Electrical Board to become break even enterprises by 2011.” “The JVP- and UNP – affiliated unions say that inflation in 2007 and 2008 eroded their real wage rates, although now inflation is low.” she further wrote. of the ruling government. End Summary. service stations in outlying areas and get back to Colombo. independent Engineers union agreed to join the strike. November 10 against the planned work to rule labor slowdown. eroded their real wage rates, although now inflation is low. the CEB, CPC, water and port workers starting January 2010.
provision in the supplementary budget for a salary increase. The Unions in the United States are run by Organised crime! That is much worse than being politicised! this women is crazy. If she does not know how politicized US trade union are she should resign her post at once. These US unions are goonies of Obama who messing up the country and making it worse than third world. Sri Lankan Unions are under political influence while American Unions are under Criminal Mafia.